According to Google the average smartphone owner looks at their smartphone one hundred and fifty times a day, and more than half of the UK population now have a one which often stays with them day and night. The same study reveals that 84% of smartphone users notice mobile advertising, and 56% have performed a search after seeing a mobile advert. Not clicked, searched. The smartphone is creating a mass brand building channel by anybody’s standards, and it is growing by the day. If you need proof just speak to any publisher in the UK and they will tell you that an ever increasing percentage of their digital audience now choses to access content via a mobile device. I know some huge publishers that already see more page impressions generated on mobile than desktop, and I know many others that will find themselves in that situation before long. So with more and more eyeballs moving away from the fixed internet and onto mobile, how are brands taking advantage of the mass market branding opportunity that smartphones offer? The answer is, in the main, they’re not. A huge percentage of campaigns on mobile are chasing clicks, not building brands. To execute a successful brand campaign I have always understood that the fundamental requirements are the right message (the creative) in front of the right people (target market) in the right environment (selected media owner) and then repeated a sufficient number of times for the message to sink in (repetition). Unfortunately, as inconvenient as it is, it is simply not realistic to expect consumers who have read and understood the message to then click, just to give us a heads-up. Look again at the stat from Google. 56% of people that saw a mobile advert searched for that brand as a result. A senior marketer at a huge global company told me they were “desperately trying to stop our media agencies optimising on just the click” yet with no other tangible ROI metrics available, the click remains the sole metric of success in most cases. Another problem with chasing clicks is that clicks can be accidental, especially on gaming apps when the frequency and speed of tapping is much higher generally than on a news site for example. Many performance agencies will buy and optimise campaigns chasing these clicks, and understandably so, because it is often the sole metric on which they are being judged and paid. 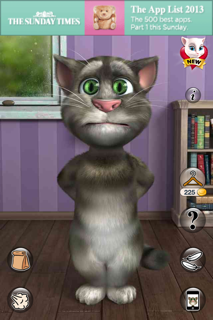 Look at the screen grab from the Talking Tom app below, a game played by kids, then look at the advert. My five year old has this app and likes it when he makes the cat pass wind a lot. I have lost count of the times I have had to correct an accidental click, by closing a browser and re-opening the Talking Tom app for him. I am pretty sure that despite it being an outstanding quality newspaper that my son has not once clicked with a view to engaging with the brand. He’s five. Around 43% of mobile usage is gaming, and there are billions of impressions in the market like this every day. This blind faith in CTR as a metric can give rise to crazy situations where a Sunday Times campaign that delivered lots of clicks on sites such as Talking Tom could be deemed a success, yet the same campaign with another network could have been positioned in front of an AB audience, who like to ready quality journalism, but because the CTR was far lower it was measured as less of a success. A recent article in The Guardian backed up this trend. Parents have been hit with bills for hundreds of pounds from iTunes, because they have downloaded free apps for their kids to play, and the children have then accidentally clicked on the in-app purchases that tend to litter these apps. The default setting on iOS devices means that once you have entered your password once (to download the app) you don’t need to enter it again for 15 minutes, and that window of time is enough for little fingers to tap up big bills. I think we really need to trust what we know about marketing a lot more, and use mobile to build brands. Then, we of course need to find a way of measuring that as we do with any other mass media. The click however is not the answer.